At the Fall 48 I spent a delightful weekend starting fine and finshing poorly. Now there is an advantage of starting in front and finishing in the back in that you get to meet so many new people as they sail by you that you might not otherwise become acquainted with. However it might be nice to actually fun to see the leaders finish from time to time which brings me to my question. CREW POSITION. I'm afraid that I sail my Scot the same way I use to sail my Thistle--with my crew and myself foreward. Perhaps hanging on to a fully extended hiking stick mught not be the best way to go about things. Not being the brightest bulb on the tree it hasn't registered with me yet that in pushing my crew against the side stay he's forward of the hiking rope and the jib cleet angle which mught be a clue as to where he should be. I'm starting to think that as i look up and see the jib and main full, with tell tales streaming back. that I might be burying the bow and destroying any hope of obtaining anything that closely resembles boat speed. So my questoj is this--where in the world should we be sitting while going to windward? Submitted by Hot Wheels on Thu, 11/10/2005 - 02:13. Submitted by Claus on Fri, 11/11/2005 - 12:51. At the last regatta I was, Harry Carpenter rigging and Q&A session. The main points I got from it is to sit as close together in the middle of the boat as possible, sand your bottom, and don't fly the spinnaker the Ben Hur style. I actually do that but only while raising or lowering the spinnaker. Other times the crew flies the spinnaker and we are close together in the center of the boat (centerboard raised up). I was surprised how many people did the Ben Hur stunt all the way down wind. Needless to say that we passed them. Disclaimer: I don't race regularly, so my experience is quite limited. Submitted by Claus on Mon, 11/14/2005 - 10:57. I got a question to my last post and I opted to post my answer here since others might find it useful as well and, most importantly, people can correct me when I'm wrong. Quick question about a recent post regarding flying a spinnaker. You said that Harry Carpenter cautioned against flying the spinnaker "Ben Hur" style. What is that, exactly? Sounds like it is standing with the tiller between your legs and with the guy in one hand and the sheet in the other. How should the spinnaker be controlled? Your description is exactly right. With doing this you are not able to steer well and the weight balance of the boat is off as well. It might also be that you are a wind block/drag by standing up (not sure about this). Since I only have one crew, I, as the skipper, have to hold the guy and sheet while the spinnaker is being hoisted. Once the spinnaker pole has been set the crew takes over the guy and sheet and flies the spinnaker. I just sit in the middle next to the crew in order to keep the boat as flat as possible. When we douse the spinnaker we have to do the same procedure. 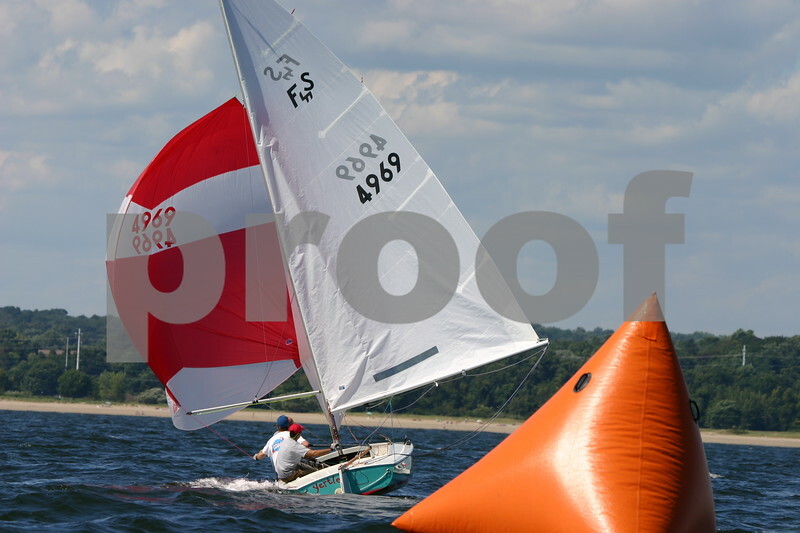 Other boats have their spinnaker rigging configured better than I do. For one the spinnaker sheets have turning blocks in the back of the boat in such a way that you can control them from nearly any position in the boat. Also the spinnaker halyard goes to the rear of the centerboard trunk, so that the skipper can raise and lower the spinnaker. I'm not sure about the exact procedures of raising and lowering the spinnaker in such a boat as I never sailed in one, but it should be more optimized that what I'm doing. I gather that you have the crew raising the chute. Submitted by johnrmcl on Sat, 12/03/2005 - 20:51. The boat should not be level or dead upright downwind. Submitted by Hot Wheels on Sun, 12/04/2005 - 22:54. Submitted by Corsa on Tue, 12/06/2005 - 02:15. Submitted by jfluard on Tue, 12/06/2005 - 09:30. Submitted by johnrmcl on Tue, 12/06/2005 - 09:43. Another photo dead-downwind, this time from astern. Submitted by Hot Wheels on Tue, 12/06/2005 - 11:25. Another photo dead-downwind, this time from astern....all crew on weather rail, spinnaker guy in hand to be pumped once per wave to promote surfing, helm balanced by weather heel. This is Eduardo Cordero [6 time Sunfish world champ] and Paul-Jon Patin who were 2nd last summer at the C of Cs. They have incredible down-wind speed. http://PhotoBoy.smugmug.com/photos/33961273-L.jpg Actually, he is 8-time Sunfish world champ. Paul-Jon has won it as well. Note that the chute halyard is eased off nearly a foot and the single-part mainsheet, which does not drag in in the water as easily and makes trimming the main at mark roundings faster. The sails are made by Doyle. Submitted by chet.ensign on Sat, 12/31/2005 - 17:07.